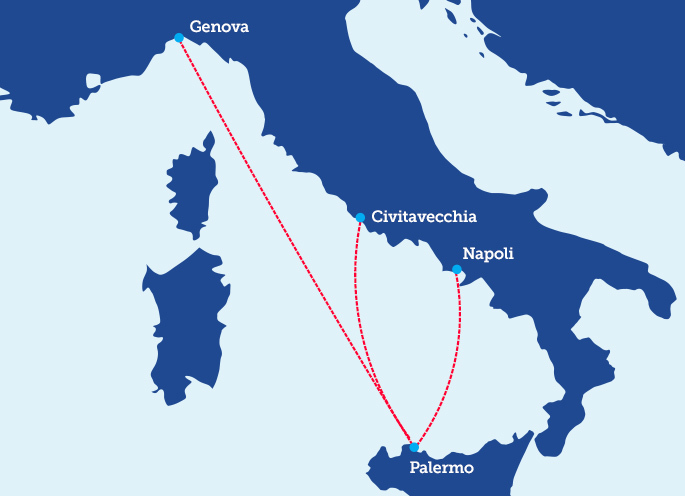 Our cruise ferries to Sicily are the most convenient way to reach Palermo and Termini Imerese with departures from Naples, Genoa and Civitavecchia. All our modern and efficient Cruise Ferries offer numerous on-board services in order to ensure utmost comfort to passengers. You can book your tickets at the harbour ticketing office or associate travel agencies. Discover the countless Sicilian beauties with SNAV and Grandi Navi Veloci: let yourself be taken to one of the most beautiful places in the world, a land rich of history and unique natural panoramas. Art, archaeology, cultural traditions, gastronomy, panoramic views, sea and unspoiled beaches: what else do you need? Book now your holidays in Sicily with SNAV and Grandi Navi Veloci!